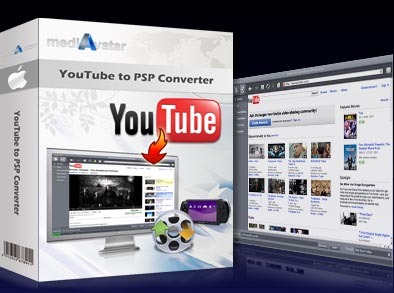 mediAvatar YouTube to PSP Converter for Mac helps Mac users to download YouTube FLV, HD MPEG4 videos and convert these YouTube videos to PSP H.264 or PS3 DivX, DivX HD videos in 1080p, 720p, 480p or 320p resolution, making YouTube videos on the go without internet connection. Diverse YouTube to PSP downloading ways are provided, meaning you can not only copy YouTube video URLs to create a new downloading task, but also use the built-in browser to browse, search, play and download YouTube videos directly. Besides downloading and converting YouTube to PSP movies, this YouTube to PSP Converter for Mac is also your video to PSP converter that can convert FLV and MPEG4 HD videos on your Mac to PSP H.264 or PS3 DivX videos. Have a free try of mediAvatar YouTube to PSP Converter for Mac, download YouTube videos to PSP and watch YouTube videos on the go with your PSP. One step to download and convert YouTube FLV or MPEG4 HD videos to PSP H.264 videos in 1080p, 720p, 480p or 320p resolution. Download YouTube FLV, MPEG4 HD videos and convert them to PS3 DivX, HD DivX videos as YouTube to PS3 Converter Mac. This YouTube to PSP Converter can also convert FLV or MPEG4 HD videos on your Mac to PSP/PS3 videos in batches. A built-in browser is provided to simplify the process of downloading YouTube videos to PSP or PS3, in which you can browse, search and play YouTube videos just as in web browser, then choose video resolution and download YouTube videos to PSP/PS3 directly. Allows multithreading and batch YouTube video downloading and converting, making it pretty fast to download your favorite YouTube videos to your PSP or PS3. Whenever you come across the video you love on youtube.com, just press one button to make it to be downloaded and converted to PSP movies without any further settings. When browsing YouTube videos on web browser and coming to your favorite ones, just drag and drop the video URLs to this YouTube to PSP Converter Mac to start downloading YouTube videos to PSP promptly. mediAvatar YouTube to PSP Converter for Mac allows you to configure proxy server in the program to download YouTube videos to PSP/PS3 when your network has problem to access YouTube. Optional interface languages: English, German, French, Spanish, Italian and Traditional Chinese.